MISSION LOG After completing a successful checkout flight with Col. Cole, the following missions were achieved. See Crew Notes for each mission. 2. 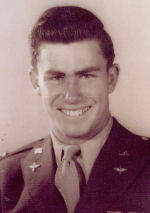 3/10/45: Mission 333 - Schwerte, Germany - Marshalling Yards - B-17 Sweet LaRhonda - experienced Combat Pilot in Co Pilot seat - Lead Squadron, left side of leader - moderate flak - no enemy aircraft - Crew learned to track flak. CONTINENTAL EXPRESS MISSIONS When the war ended, Aerial Tours of Continental Europe and targets bombed by the 303rd BG (H) were arranged for group personnel. The "Continental Express" gave the groups non-combat personnel and opportunity to see how their own activities made valuable contributions to the combat activities of Group air crews. Tour #1: The Squadron formed as in a regular combat mission and after arriving in Europe separated into individual flights. Each aircraft then toured various areas including Paris, Frankfurt, Bonn, Cologne, and Munchen. During this tour it was a pleasure to fly close to the Rhine River pass Cologne and circle the Eiffel Tower. Tour #2: The Squadron formed as it would for a normal combat mission but we had pour weather conditions. As we approached the English Channel, the weather forced the Squadron down to tree tops causing the mission to be aborted. LAST MISSION REPORT On April 20, 1945, I was assigned to the 358th Squadron as a Flight Commander and was recommended for promotion to Captain. The promotion to Captain was turned down because I was only 20 years old. For the mission to Pilsen, take-off and formation gathering was fairly routine. However, while flying over the English Channel, we learned that the Allied Radio had broadcast a warning to the Czech workers to stay away from the factory since it was the target. Such advance mission warning was unprecedented. Anti-aircraft fire at Pilsen was intense and we were tail - end Charlie. The Lead Bombardier was required to use visual techniques for this target. Because a small cloud covered a view of the target, two attacks of the target were needed. All returning B-17's had battle damage, three B-17's landed away from the base, one B-17 was lost, and the end of the runway looked like a parking lot. Flak and Me 262's provided many hazards but extreme weather, associated with flying in formation in and out of clouds, provided the biggest problem for pilots and Mission success.